Created for human or animal consumption using latest molecular biology techniques. Specific change introduced into their DNA by genetic engineering techniques. 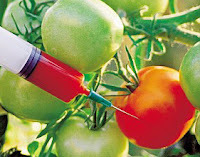 Nutrition: single crop can be genetically engineered to provide multiple additional vitamins. In many third world countries, population is heavily dependent on single crop for example Asian nations depend heavily on rice. Unintended harm to other organism. GM crops can cause unintended effect on other organism that live on normal crop.For example Caterpillars can die on feeding GM crops. Pests becoming more resistant . Pests could develop resistance to altered crop then controlling them would be very difficult. It will be a similar case as Multi-drug resistant TB in human beings. Allergenicity : Individual may be allergic to a particular GM crop. Many political parties, farmers complaining introduction such GM cotton, Brinjal(has been stopped) as the cause for increasing farmer suicides in Karnataka, Maharashtra region. farmer’s dependence on private seed cos are said to be the reasons. 1. Unnecessary warning may create panic in consumer which may bring down the GM crop market. Retailers will suffer. 2. Requirement of extra infrastructure for segregation of GE and non-GE products. 3. Need not label as non-GE products are available with certified organic marks. Thanks Rahul. You are welcome to discuss and add information here !! !